Kanata Lakes also known as Marchwood-Lakeside is a neighbourhood in Kanata North Ward in the west end of the city of Ottawa, Ontario, Canada. Prior to amalgamation in 2001, it was located within the City of Kanata. It is located north of the Queensway, west of Beaverbrook, east of Terry Fox Drive, and south of Morgan's Grant. 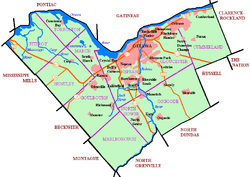 Kanata Lakes is located about 20 km (12 mi) west-southwest of Downtown Ottawa. According to the Canada 2011 Census, the population of Kanata Lakes was 12,668. Kanata Lakes' main street is Kanata Avenue, which runs over the Queensway into the neighbourhoods of Katimavik-Hazeldean and Glen Cairn where it becomes Castlefrank Road. Kanata Avenue has four major side roads: Knudson Drive, Walden Drive, Goldridge Drive, Goulbourn Forced Road and Campeau Drive. The area that is today Kanata Lakes was originally part of the Township of March, and was first settled by Europeans in the early nineteenth century. One site dating from this era is Pinhey's Point. It remained mainly agricultural until the 1960s when it became the site of heavy development. Modern Kanata is largely the creation of Bill Teron, a developer who purchased 4,000 acres (16 km2) of rural land and set about building a model community: "A Garden City". The lands around the Kanata Lakes Golf & Country Club formed the initial core of Kanata Lakes when it was developed years later. The Kanata Centrum power centre; together with adjacent developments. Landmark Kanata Theatres, the largest movie theatre in Ottawa. High school sports such as "Earl of March Senior Boys Basketball" and "All Saints Senior Boys Basketball" are very popular as well.